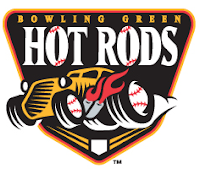 The Game: The Bowling Green Hot Rods lost their fourth straight game, losing to the Dayton Dragons 5-3 on Saturday night. The Hot Rods gave up the lead early but were unable to generate a comeback despite holding the opponent off the scoreboard for the final seven frames. Dayton took the lead in the first inning courtesy of two home runs. Chris Richburg hit a two run homer later followed by a two run home run by Mark Fleury to take a 4-0 lead. The Dragons added another run in the second inning. Efrain Contreras singled to center then later scored on an RBI double by Andrew Means to take a 5-0 lead. The Hot Rods collected their first run of the game in the third inning. Ty Morrison doubled to left to lead off the inning. Morrison then scored on a single by Chris Murrill to post the first run of the game. Bowling Green added another run to their total in the fifth. Tyler Bortnick singled to center to get the inning started. Bortnick advanced to second on a balk and later scored on an RBI single by Mark Thomas. The Hot Rods would pull to within two runs of the lead by scoring again in the ninth. Chris Murrill singled on a line drive to lead off the inning. Brett Nommensen drove him home with a double to center. But the Hot Rods could not generate any more runs and lost 5-3. Jason McEachern fell to 0-4 on the year with the loss, allowing 5 runs on 7 hits with 2 strikeouts and a walk in 4 innings. Jairo De La Rosa pitched 2 no-hit innings of relief with 2 strikeouts. Scott Shuman threw the final two shut-out innings, allowing 1 hit and striking out 3. Hot Rods Player of the Game: Chris Murrill; 3 for 4 with an RBI, run scored and a walk. Tyler Bortnick: 2 for 5 with a run scored and a strikeout. Jason McEachern: 5 runs on 7 hits with 2 strikeouts and a walk in 4 innings. Ty Morrison: 2 for 4 with a double, run scored and a strikeout. A Look Ahead: The Hot Rods (5-18) will face Dayton (12-11) again on Sunday in the third game of the four game series. Wilking Rodriguez (1-1, 2.74) will be on the mound against Justin Walker (0-2, 6.16). Will there be any changes to BG's roster soon? Maybe swap some players with some in Extended? Obviously,something's not working in BG. Perhaps it's time for pitchers Aaron Dott and Devin Fuller to move up? Elias Otero? Burt Reynolds? ~forgot to mention Hunter Hill, who is also at Extended.